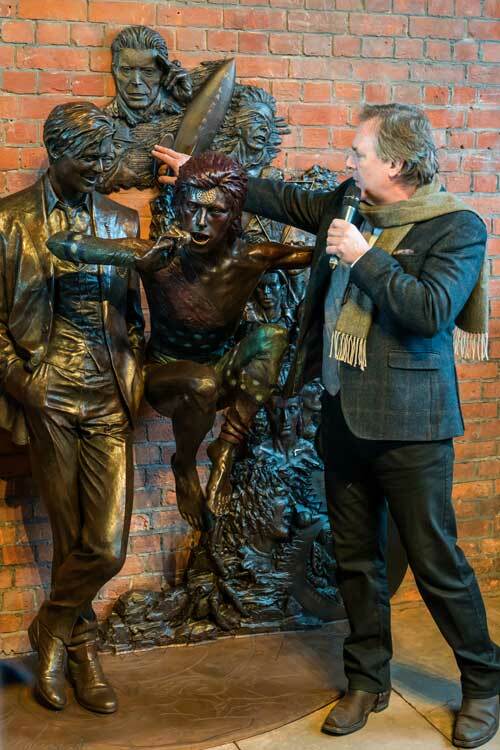 Andrew’s life-size bronze sculpture of David Bowie was unveiled in The Market Square, Aylesbury, Buckinghamshire on 25th March 2018 to great acclaim. It was a world-wide media event with the news of the unveiling broadcast as far away as Australia, New Zealand, the USA, and Canada. The world’s first David Bowie tribute sculpture tells the story of Bowie’s life and features two life-size figures, the main figure of Ziggy Stardust leaping in the air, singing into a microphone, with a more mature standing figure of Bowie looking down benevolently at his former incarnation. The design features a background bas-relief depicting 13 portraits of Bowie’s many personas throughout his career. Next to the bas-relief and behind the standing Bowie figure is a bronze ‘gold disc’ which displays Bowie’s most important albums. It is a ground breaking example of Contemporary Realist sculpture which tells the story of one of the world’s most famous music and cultural icons. Andrew’s sculptures are unique in their highly skilled attention to detail and this aspect of his work makes them resonate with life, adding a quality of realism rarely seen in contemporary sculpture today. The sculpture was commissioned by David Stopps of Friars Aylesbury – the famous music venue where Bowie launched his Ziggy character, and his band ‘The Spiders from Mars’. Work began on the sculpture in 2017 at Andrew’s Devon sculpture studio, with the bronze being cast at a foundry in Hampshire in early 2018.